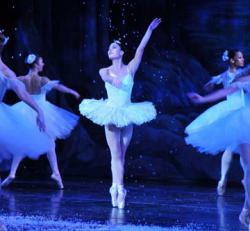 Nutcracker: Dancer Elisabeth Scherer, who grew up in Dorchester, performs as the Snow Queen in Joe Mateo Theatre Company’s The Nutcracker. Photo by Karen Wong This week, six-year-old Roberta Owens-Pearl, who attends the Condon School, will be among nine young Dorchester residents charming audiences in the José Mateo Ballet Theatre’s (JMBT) 26th Anniversary “Nutcracker” Tour, which, after stints in Duxbury and Cambridge, will end up at the Strand. Roberta will be appearing on the same stage that her father, George S. Pearl, Jr., and her namesake grandmother appeared on in a 1991 production of a Tyler-Perry-ish torn-between-two-worlds drama. Now her Blue Hill Avenue neighbors and other Dot residents will get to see Owens-Pearl and the rest of this acclaimed company that first performed at the Strand in 1987. Generous funding means more than a thousand people will see the show for free. With support from ArtPlace America and the Kresge Foundation, the Boston Foundation has partnered with key leaders in Uphams Corner to fund cultural groups including JMBT through ArtPlace Uphams Corner. Hundreds of complimentary tickets are being given to such Dot groups as Dorchester House, Lena Park CDC, Project R.I.G.H.T., Roxbury Center for the Performing Arts, Sportsmen’s Tennis and Enrichment Center, and the Boys and Girls Clubs of Dorchester as well as to the Mattapan Community Health Center. Mateo, who for the first time in a quarter century will not be performing the role of the mysterious Dr. Drosselmeyer this season, often emphasizes that his is the only professional “Nutcracker” production in the area to hold open auditions for students outside of its own school. Over 70 kids auditioned the Kroc Center in September (compared to only 15 two years ago!). About one of ten made the cut and appear at all three locations: Cambridge, Duxbury, and Dorchester. The Dot kids were cast as either Mice or Polichinelles (mini-clown figures who merge from under Mother Ginger’s billowing hoop skirt to do a short dance). This year’s Dorchester corps de ballet includes Gizelle Fernandez (7), Jahzarra Knox(7), Alora Lenane (5), Michael McKoy (7), Roberta Owens-Pearl (6), Leiya Silveira(6), Makayla Sweeting (7), Jasmine Hasan (8), and Aiyana Ross (9) Seven-year-old Yaziely Matos from Mattapan is appearing as a Mouse. Elisabeth Scherer, a member of the adult ensemble who grew up on Ashmont Hill, confirms she will return for the third year to dance the role of the Dew Drop Fairy, who leads the Waltz of the Flowers sequence. Scherer’s is one of the longest solos in the ballet. The three school performances run Wednesday through Friday. Public shows are Fri. at 7 p.m., Saturday at 2 p.m. and 6 p.m., and Sunday at 2 p.m. and 5:30 p.m. Tickets run between $15 and $50. To reserve seats call 617-354-7467 or go to ballettheatre.org.